Easter Season Prayer - My Catholic Life! Halleluia! Lord, Jesus, You have risen from the dead and are gloriously triumphant! Lord, I offer You profound thanksgiving that I may join in the celebration of Your Resurrection! I thank You for loving me so much that I have been invited to participate in the new life won by You. Dear Lord, the path to the Resurrection was one of exceptional pain and suffering. It required of You the total sacrifice of Your life. You held nothing back but poured out Your life to the last drop of blood. Risen Lord, the joyful message is that suffering and death were not the end. You rose triumphantly in a new and glorified body, opening the door for all who believe in You to do the same. 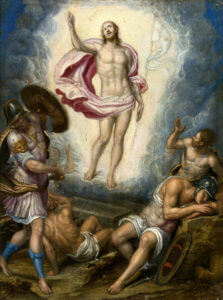 Draw me in, dear Lord, to Your suffering and death so that I may also be drawn into the glory of Your Resurrection. Give me the courage You had as You endured so much. Help me to face the crosses in my life with Your strength. As I do, fill me with hope as I anticipate the new life You will bring from all sufferings united to You. Halleluia! All glory and praise to You, dear Lord, for Your Resurrection! Halleluia! May the glory of Your Resurrection be loved, embraced and proclaimed until the end of time and forever more!